The shallow depression in front of the church marks the site of a pond, one of the principal sources of the stream known as the Wellesbourne which ran all the way to the sea at Pool Valley. Nos.13-25 Church Hill opposite are known as Pond Cottages, plain, slate-roofed houses from the first half of the nineteenth century which were restored jointly by the corporation and the Patcham Preservation Society in about 1964. Nos.28-29, two flint cottages (originally four) on a timber frame, were probably refaced in the eighteenth century, while nos.33-36 are early-nineteenth-century flint cottages with red-brick dressings. No.10 on the eastern side, half covered by creeper, has an eighteenth-century front of knapped flint on an older timber frame. All these old cottages are listed buildings. The large Black Lion Hotel opened in 1929. The inn originally stood at nos.110-112 Old London Road, but with the opening of the Patcham bypass in 1926 it became prudent to build a new hotel on the site of an old house by the main road. The lowest part of Church Hill, together with part of Old London Road, was once known as Spring Street and was often flooded by the Wellesbourne in winter. Here nos.4-4a are eighteenth-century listed flint cottages, but the adjacent no.5, also listed, has been shown to date from the fifteenth century and is one of the oldest buildings in the whole borough. Patcham Fountain was erected in 1887 to commemorate the golden jubilee of Queen Victoria on the site of a donkey wheel which had supplied the village with water; the present structure is a replacement of the original which was demolished by a bus. I am sure that my house is Elizabethan. The houses lower down Church Hill are eighteenth century but we had always understood that no. 24 was an Elizabethan smallholding. Can you enlighten me? My father used to be a chartered surveyor and surveyed one of the houses in Church Hill. He told me that the beams in the roof were smoke blackened indicating that it was once a single storey building with no ceiling and an open fire. Does this make it older than earlier suspected? Personally, I think that Church Hill has to be the most magical street in the whole of Brighton & Hove. 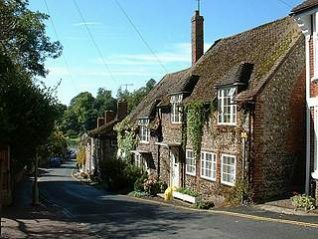 I rented a cottage there (number 22) for a couple of years and never ceased to be touched by the picturesque beauty of the All Saints church and the surrounding houses.